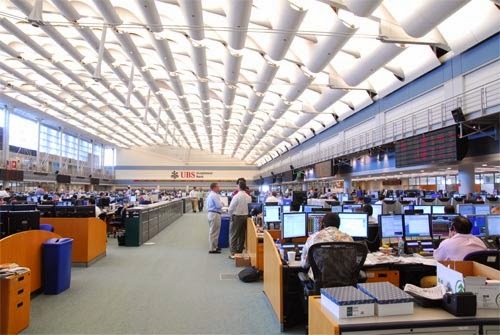 UBS Investment Bank boasts the world's largest trading floor, located in Stamford, Connecticut. It has 1,400 seats managing more than 1,689,000 transactions a day. 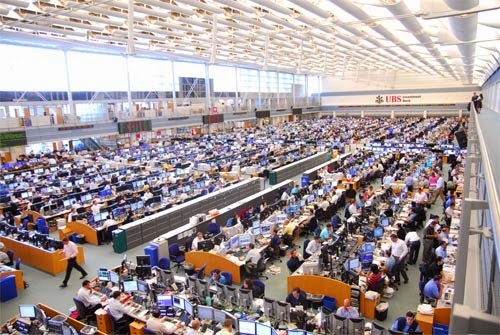 With 1,400 seats, 2,000 computers and 5,000 monitors, the 103,000 square-foot facility is noted by the Guinness Book of World Records as the largest single trading floor in the world. 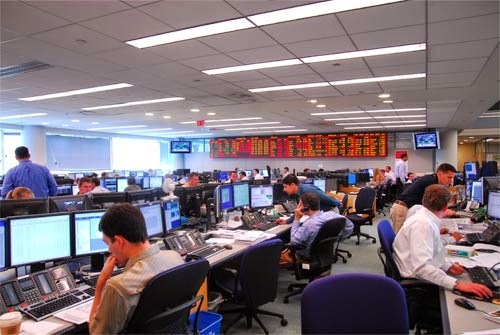 The floor is home to traders, sales traders, quants, technology support, executives and others among its various groups, which include fixed income, commodities, currencies, money markets, derivatives, equities, international trading, algorithmic trading, direct market access, program trading and more. UBS manages more than 1,689,000 transactions a day. The firm deals in almost every asset class and trades across almost every region. 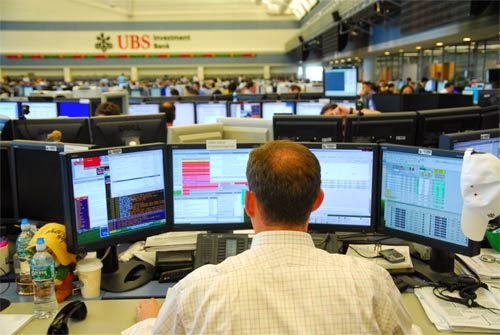 The photo gallery below will take you through the mammoth trading floor, offering both big-picture photos to illustrate the size of the floor as well as close-ups of some of the trading desks to offer more detail on the technology UBS uses. 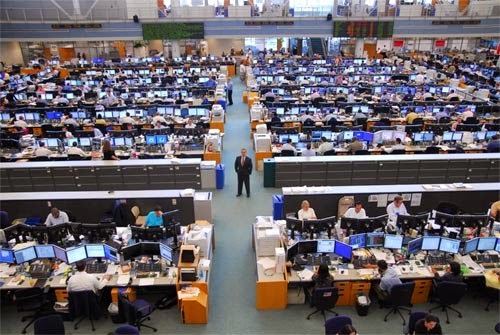 Will Sterling, Head of Global Direct Execution, UBS, stands on the catwalk looking down on the largest trading floor in the world. 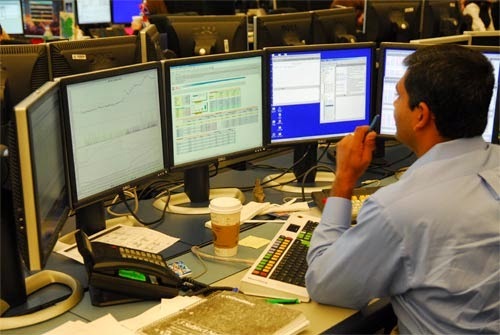 The equities group takes up 600 seats, 110 are traders. 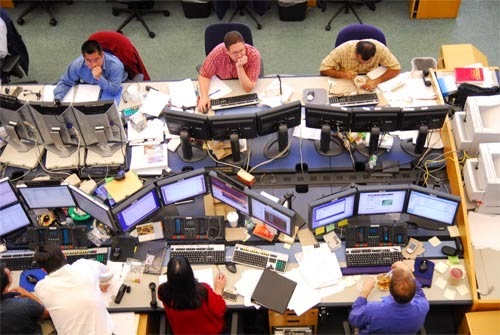 The fixed income and equities portions of the floor are separated by two rows of technical support staff, who are positioned in the center of the floor so as to be easily accessible to all traders and their teams. 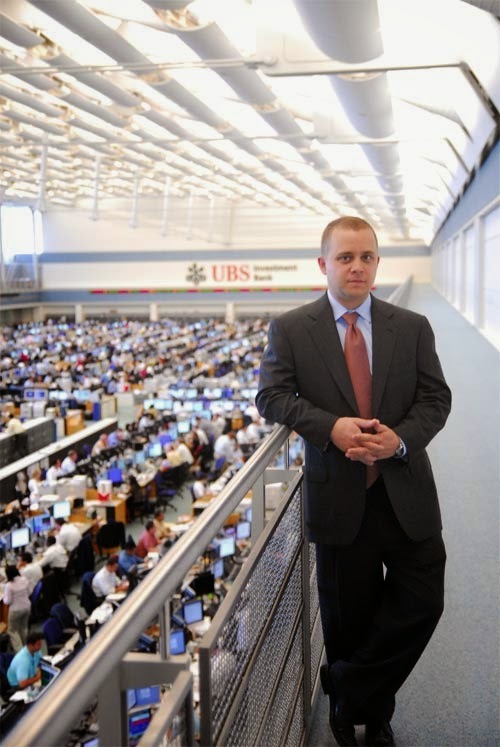 Will Sterling, Head of Global Direct Execution, UBS, stands amid UBS' 1,400-seat multi-asset trading floor. 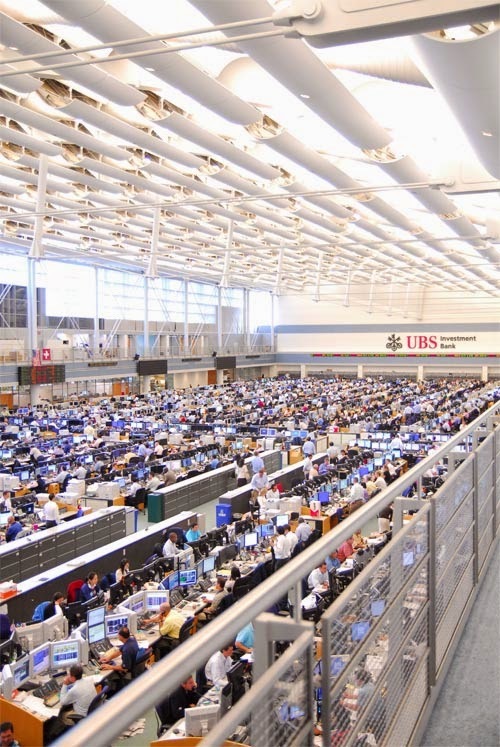 The UBS trading floor is the same size as 26 tennis courts or two football fields. 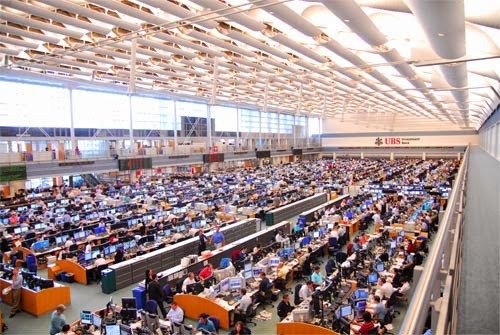 The Guinness Book of World Records has recognized the column-free trading floor as the largest in the world. The floor houses more than 2,000 computers with more than 5,000 monitors. 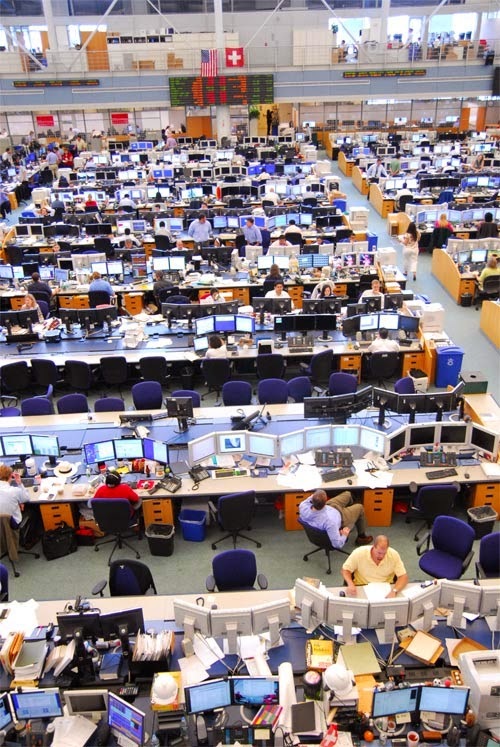 This photo shows almost the entire trading floor. The Fixed Income Group is shown to the near left of the row of filing cabinets. 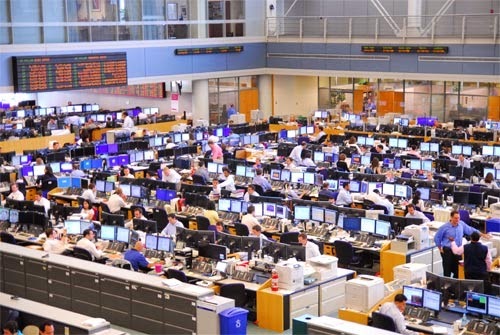 To the near right of the row of filing cabinets is the CCMM (Commodities, Currencies and Money Markets) Group. The far end of the photo is the 600 seat Equities Group. 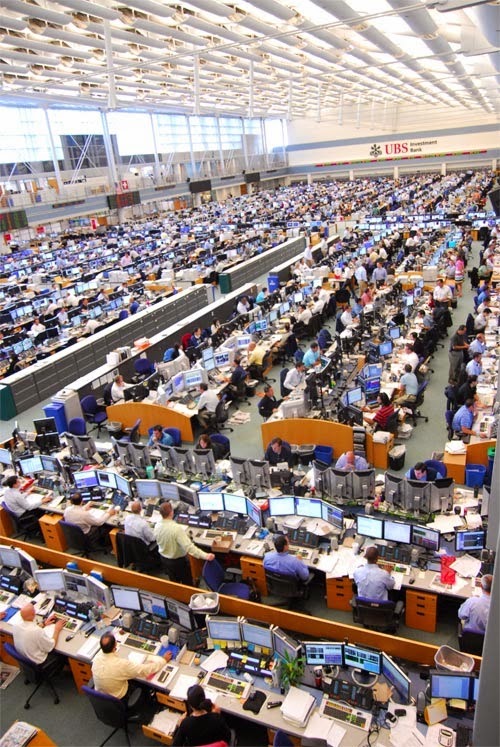 This photo shows the vast 1400 seat trading floor which includes commodities, currencies, money markets, equities, derivatives and fixed income. The floor has an arched roof that rises about 40 feet above the floor, freeing it of columns or walls. The Fixed Income Group includes the following desks: high-grade syndicate, prime brokerage, credit delta, CDO, high-yield sales and trading, structured product distribution, structured trading, investment grade, swaps, derivatives and government trading. 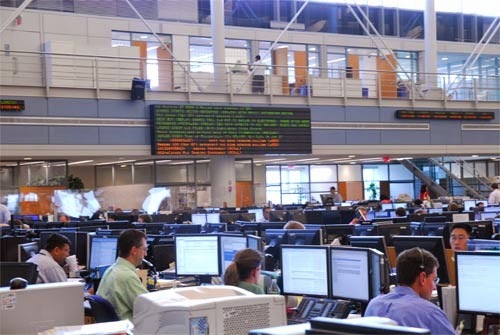 The trading floor is home to sales and trading, operations, and technology. The open architecture design of the floor promotes integration across the functions. There is virtually no line between the business, technology and management. 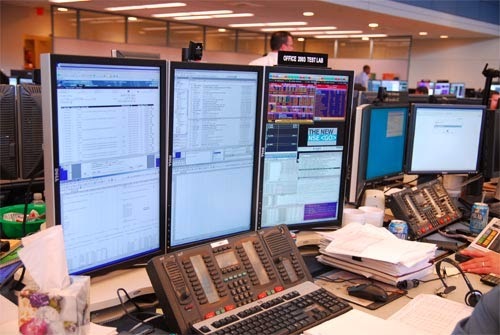 FX Trader for Hedge Fund Distribution ---- This trader's workstation is comprised of a BT trading turret and four screens that depict (l. to r.) chats and Bloomberg data; client and interdesk chats via MindAlign; OneTool, a deal-entry blotter; and the price ticker. 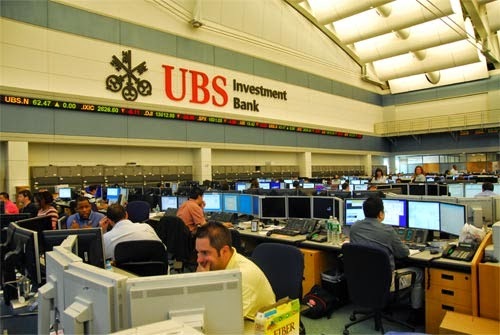 UBS creates its own algorithms, which are used internally and are offered to clients. Traders can access any dark pools to which UBS' dark book, PIN (Price Improvement Network), connects. This trader trades fixed-income rates derivatives at UBS. He depends on three double-height screens. The right screen shows the... trader's market data from Bloomberg as well as ECNs, including BrokerTec, eSpeed and TradeWeb. 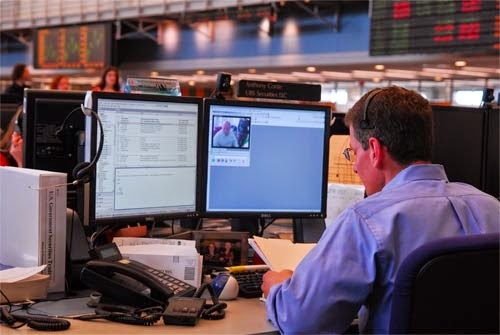 The middle screen is used for e-mail and the firm's internally developed instant messaging system. The left screen features a DataSynapse grid-based application for valuations. 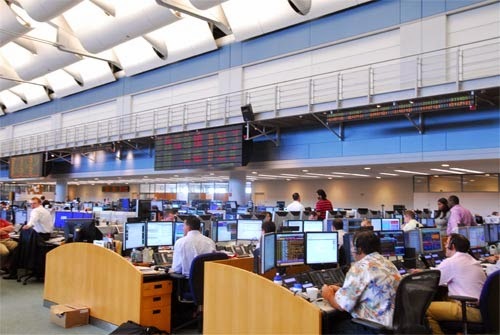 The Fixed Income Group occupies more than 400 seats, including traders and other support and IT functions. UBS has a 16-foot-wide satellite on the roof which provides current weather statistics to the Energy Business. They also have two meteorologists on staff to predict whether the weather will affect the energy market.